Have you ever had a lot of potatoes and wondered how to freeze them? Well look no further because I have just the tips for you to do it successfully at home. This is especially wonderful when potatoes are in season in your area ... nothing better than fresh from the farm or market goodness! It does take a little work, but so worth the effort and costs just pennies to do! I received 11 large baking potatoes free (again it pays to know your farmer) and made mine into diced potatoes and French fries. *Note - Baking potatoes (such as Russet), including Yukon Gold, freeze better than red potatoes. I kept all the cut potatoes in a large bowl filled with ice-water until ready to cook. Place water in large stock pot adding 1-2 tsp. sea salt and bring to a full, rolling boil before adding the potatoes to blanch before freezing. 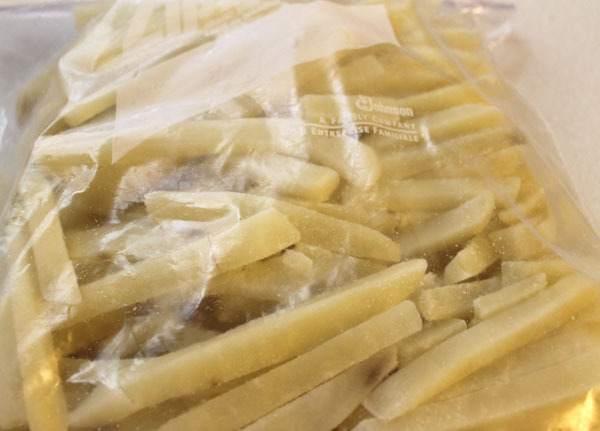 When ready to use after freezing, cook them frozen, do not thaw first. The Potatoes will brown if you defrost them. Peel two pounds of potatoes. (or whatever amount you want to work with.) 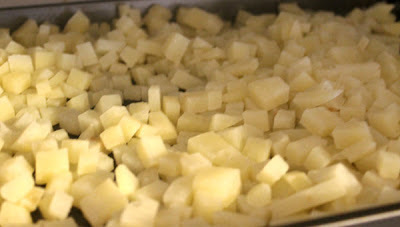 Cut the potatoes into 1-inch cubes. Simmer the diced potatoes in salted water until just tender. Spray a sheet pan with non-stick cooking oil and spread cooked potatoes in a single layer on the pan. Place the pan of diced potatoes in the freezer until frozen solidly. 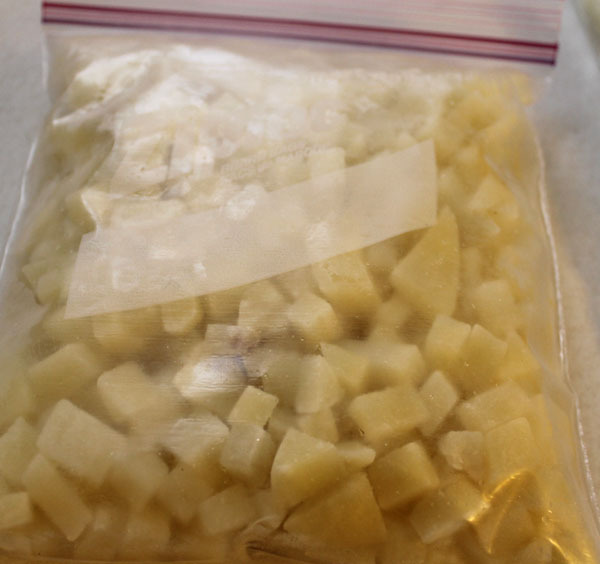 Transfer the frozen potato cubes to freezer bags or containers to use as needed. Shred or grate 2 pounds of potatoes (or any amount you want to work with). Place grated/shredded potatoes in a bowl of iced water until all potatoes are shredded. Drain the ice water when you are ready to prepare the potatoes for freezing. Place the shredded potatoes into the boiling water just until they begin to be tender. Drain the potatoes thoroughly and place on the sheet pan in mounds or patties. Leave on the sheet pan until solidly frozen, then store in freezer bags or containers. Peel and cut the potatoes you want to freeze into "french fry lengths." Freeze until solid; transfer to freezer bags or containers and put in freezer. Yield: 11 large baking potatoes yielded one gallon bag of French fries and two quart bags of diced potatoes. This is a great idea. Having the potatoes ready to eat in the freezer makes them more likely to get used instead of turning into seed potatoes for next year. shoot, I tried this but my potatoes turned black when I unfroze them, what am I doing wrong?